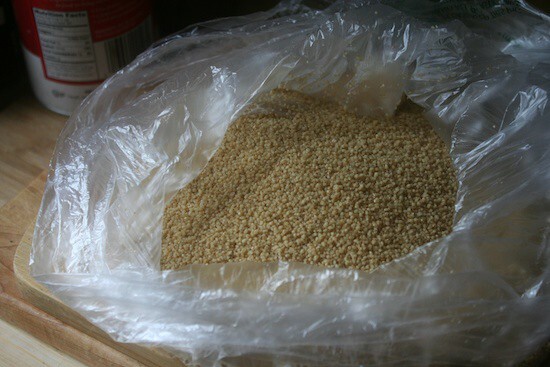 Couscous purchased in bulk is cheaper and sometimes manages to save waste. What is couscous, and how does it taste? Couscous is, well… flour and water. No, seriously. It tastes an awful lot like pasta, just much smaller “noodles,” obviously. It’s basically a North African pasta, even though it has French and Israeli variations… it’s North African. How do I choose quality couscous? For starters, check the back of the label; if it has weird stuff in the ingredients; if it has more than flour – usually says “durum wheat” or “semolina wheat” but can just say “flour” – and water, then you need to give it the side eye. Even if you buy it in bulk – like at the Whole Foods bulk containers – the bulk bin should still have the ingredients listed as well as the caloric content of the ingredient. How do I store couscous after buying it? Couscous, like any other pasta product, should be stored in an airtight container. It doesn’t require refrigeration, and can be stored in the dark (like, say, a pantry or a cabinet.) If you buy your couscous pre-packaged, be sure to respect the date on the container; processed foods like that could have easily be resting in a warehouse for months before it made it to the shelves and into your cart, so it’s best to be careful. What goes well with couscous? Just about anything you can do with pasta, you can do with couscous… sans the heavy sauces. Like, a thick cream sauce would turn couscous into soup, which – while it can be done – isn’t really appropriate. There are tons of other things to use for that, instead. It’d be wasting the actual texture that couscous provides. How do I cook this couscous for the boot camp? Truthfully, you cheat. There. I said it. You cheat. 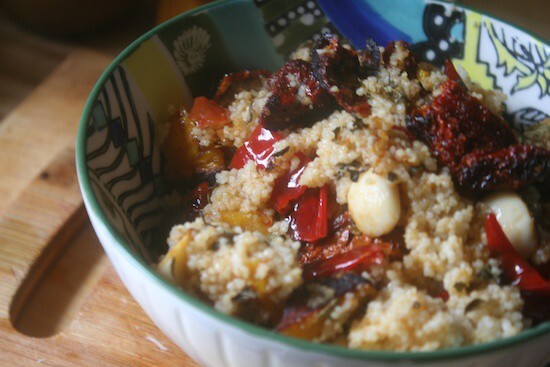 Israeli couscous with sun dried tomatoes, garlic, red peppers and butternut squash. Not on the couscous, but on the stuff for it. 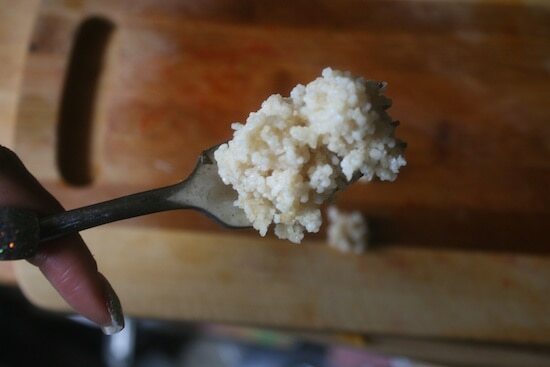 If your couscous looks like this, it’s not done yet. Cooking couscous is easy, similar to cooking quinoa. It’s always equal parts couscous to water – meaning, if you’re cooking a cup of dried couscous, you will use a cup of water – and you’ll want to use a teaspoon of oil to wipe around the bottom of your pot before you cook it. 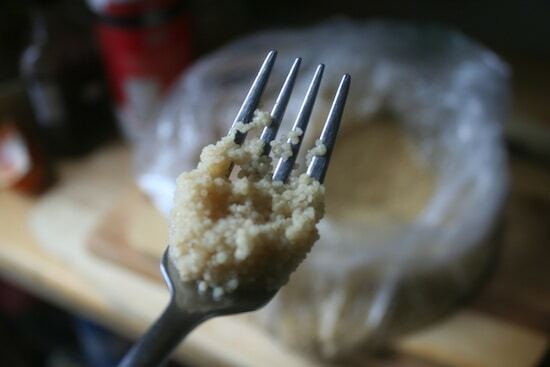 The teaspoon of oil is for the pot, not the couscous, so you don’t need more of it just because you might be cooking more than a cup of couscous. Depending on the size of your pan, you might need a bit more oil… that’s okay, too. Each cup of dried couscous yields about 2 and a half cups, cooked. Wipe the bottom of you pot with your oil, then pour in your water. Bring it to a boil, then pour your couscous inside. Turn off your heat, cover your pot, and leave it for five minutes. The little granules will absorb the water, making them puff up and become fluffy. Use your fork to stir it up. It’ll probably double in size again after that. 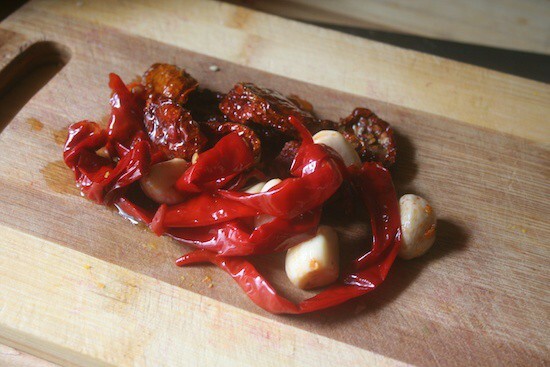 If your grocery store has an “olive bar” with olives, garlic, cornichons (little pickled cucumbers), and the like, reach for some sun-dried tomatoes, a few cloves of garlic and a few peppers. (You should also be able to find this stuff in a jar in the section near the tomato sauces in your store, if they don’t have that antipasto bar.) A cup of this stuff for every half-cup of couscous you’re cooking. Drop ’em on your cutting space, chop ’em up, then throw them in your couscous, in its pot, with a tablespoon of dried oregano and a pinch of salt. 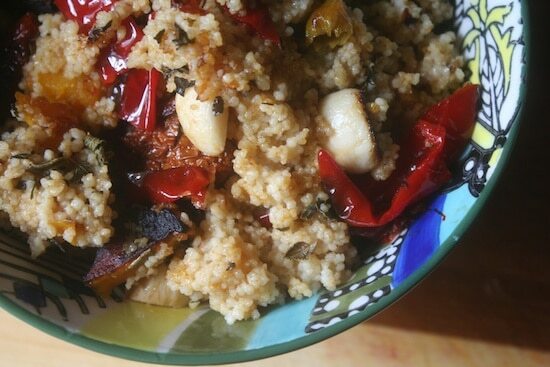 Couscous with garlic, red peppers, sun-dried tomatoes and oregano. It’s literally that quick. You won. I never comment but I wanted to say that couscous should be rinsed and then steamed. And it should never be clumpy. Israeli CousCous (pearl couscous) can be boiled in water. My husband is North African. He talks about how his grandmother and mom use to make couscous and let it dry in the sun. I like Israli couscous better for salad and dishes. I love your website and read it every day! I’m not going to disagree with you – steaming couscous is actually a common and accepted practice – but I am going to say that lots of people don’t have the equipment necessary to steam something as small as couscous. Cheesecloth and colander, sieve… the purpose of the boot camp is to make everything as simplified as possible for a person with even the barest of bones in kitchen equipment, or only encourage them to buy a few inexpensive items. Thanks for the tip about lining the pot with oil to keep stuff from sticking. I hate that about couscous but I love the taste of it so this will help me to eat it again. I love couscous. I’m going to have to try out this recipe. I love this stuff so much, I eat it on it’s own. 🙂 Thanks for the great recipe. I love couscous. I cook it all the time. I started eating it when I took a CHIP class.